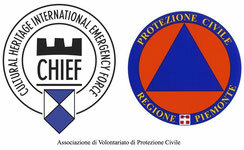 - A non-profit association for the protection of cultural heritage. Se vuoi sostenere le nostre iniziative, puoi anche decidere di devolvere il tuo 5x1000 all'associazione. Per farlo è sufficiente indicare il proprio sostegno riportando il codice fiscale dell'associazione: 95170880108. CHIEF Cultural Heritage International Emergency Force onlus is a laical, non-party, democratic, pluralistic, non-profit association, born to promote and facilitate the direct involvement of all those citizens who intend to actively contribute to the development of the society. The association has its legal headquarter in Turin and operative offices in Genova and San Carlo (Ferrara) and also a deposit in the Port of Genova, by the CULMV. CHIEF onlus aims at pursue Civil Protection values and in particular the protection of cultural heritage in case of emergency. It involves professionals in the field of cultural heritage and risk management in order to maximize their synergic contribution in the safeguarding of territories, sustainable development and the increase of the overall level of resilience of environments and peoples. The association intervenes with of ad hoc prepared teams at regional, national and international level, only during the emergency phase, without interfering with reconstruction. Furthermore the association designs and implements studies and researches concerning prevention and prevision, organizes information campaigns and integrative activities in schools and for all the citizens. CHIEF onlus, following policies of full transparency, disseminates the results of its projects and activities, participating to conferences, publications and exhibitions.